This is one of the best transitional class III-IV runs in California. At lower flows, the first mile below put-in at the highway 140 bridge (a mile below El Portal) is continuous class III with some low IV. 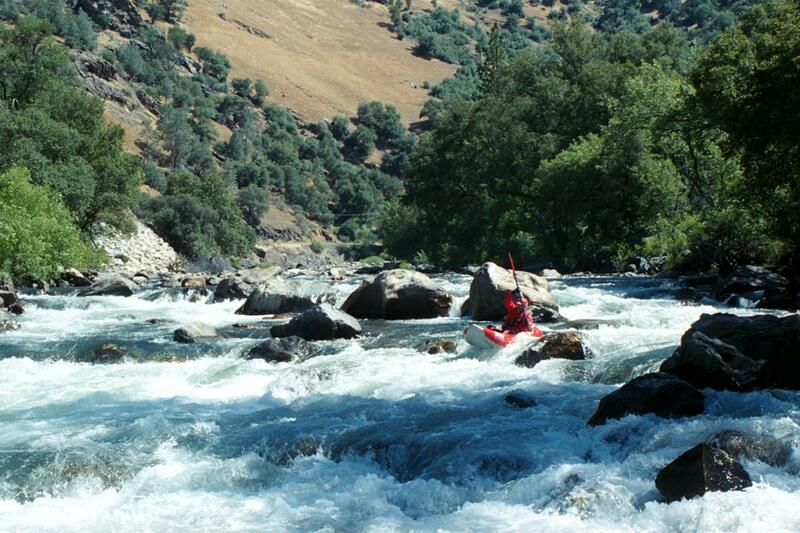 Although the whitewater requires constant maneuvering, visibility is good, so you can pick the best route without getting out of your boat to scout. Despite the 100 fpm gradient, rapids are not as tough as the class IVs downstream, which are more dramatic affairs separated by pools and class II-III rapids. 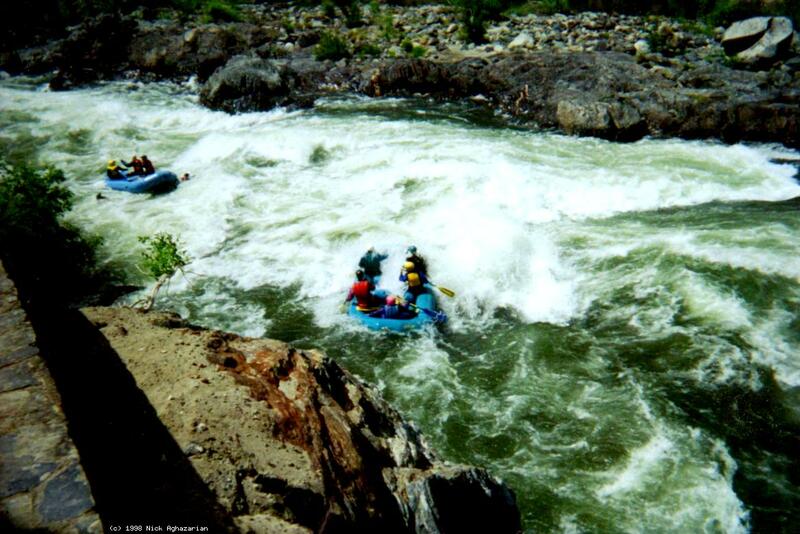 Many rafters put in at Cranberry because they think they are avoiding difficult rapids, but Ned's Gulch is actually harder than Nightmare Island and Chipped Tooth, so class IV boaters might as well put in at Red Bud. A ways below Ned's Gulch is the former suspension bridge, where class II boaters often begin their float. Be careful though: although there are class II routes thru all the rapids, some (avoidable) holes are definitely class III in nature. A ways below Briceburg the action picks up to class IV again, with a dangerous waterfalls shortly above the North Fork Merced. A good class IV+ Merced plan is to put in at the highway 140 bridge in the morning, and take out at Cranberry, on river right across from Cedar Lodge. Then you could run a bicycle shuttle partially along the paved but seldom-traveled road on river right. In the afternoon, put in at the former Chevron station in El Portal, and take out at Red Bud to avoid the class II lull just below. 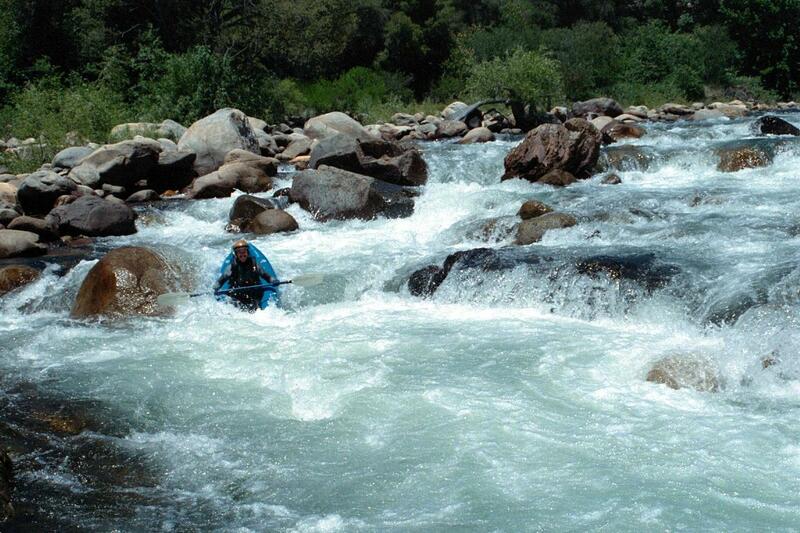 Although the gradient of the mile from the former Chevron gas station in El Portal to the 140 bridge is only a bit more than downstream, 110 fpm, the individual rapids are quite steep, often requiring scouting and approaching class IV+ in difficulty. The first one is very steep on the left, where there is more water, with a short break in the middle. The second one, along the road, has a long segment of pure white whitewater. The third one has a congested final drop, but is easier than the others. Upstream in Yosemite Valley, the Merced tapers off quickly from its many source streams and waterfalls to gentle class I-II, as described by the Merced in Yosemite Valley writeup. The river picks up speed below El Capitan, becoming class III-IV for a short distance, a section sometimes run by rangers. Between the end of Yosemite Valley and El Portal, the Merced is class V+ with many portages. High-water trips starting at El Portal often end in semi-disaster with loss of boat, or worse. 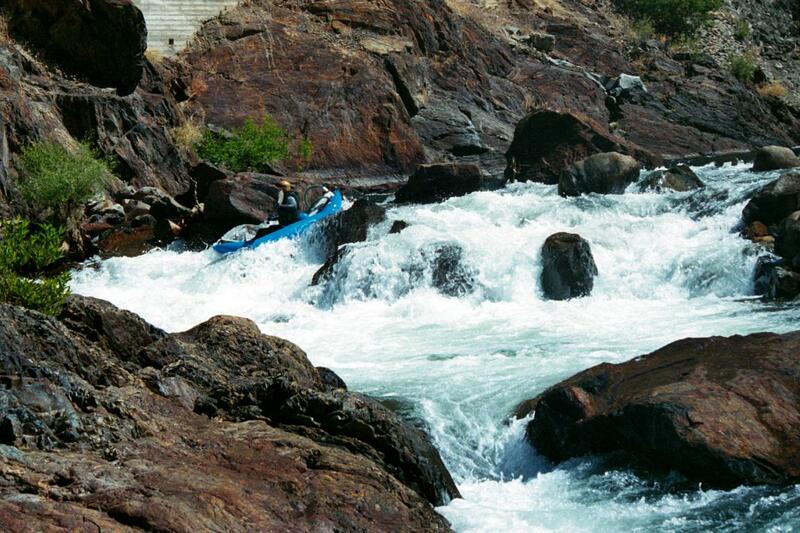 A guide died in 1995 on an after-hours rafting trip with other guides when the river was running 8000 cfs. A kayaker died in 1985 after becoming trapped underwater by a downed tree at 2000 cfs. Put in above the highway 140 bridge, either from the steep left bank, or a ways upstream on the right bank. There is a pool before the bridge, but a very long boulder garden rapid begins immediately below. Gravel Pit, class IV, another long boulder garden with a very steep final drop into and along a bedrock outcropping. 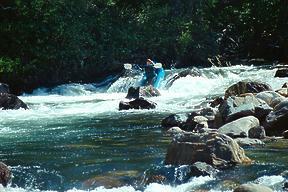 This is followed by a long right curve, more difficult on river right (see photos below). Next comes an easier right curve, where at low water the right side of the river is much higher than the left, and has more water! In final drop of Gravel Pit Good brace in first right curve! Sewage treatment plant for Yosemite Valley on the right. 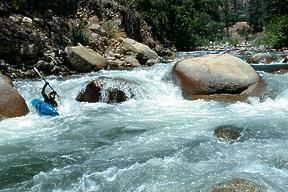 Rapids ease. Bridge and Red Bud picnic area, alternate put-in. Rafts usually put in here because the rapids are more wide-open downstream. 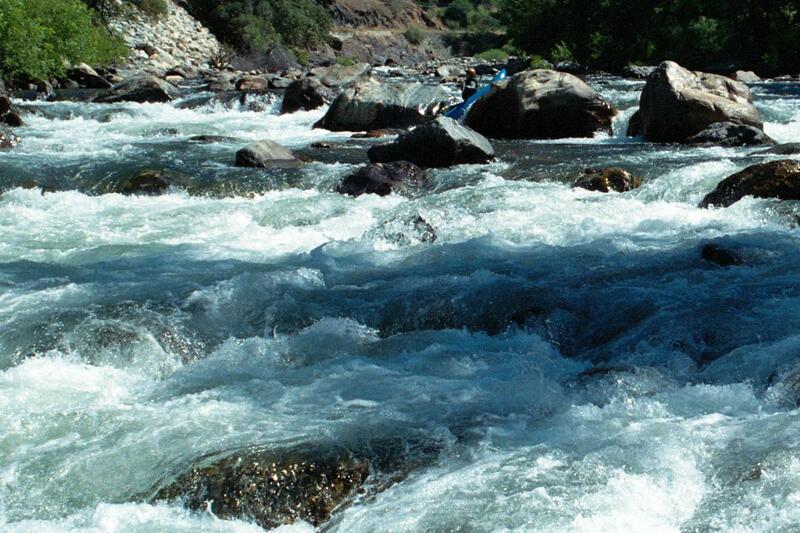 Rapids ease some more, but remain mostly continuous. After a pool, the river bends right, then turns left and splits around an island. At low water there are two distinct drops on the right, which is the more challenging side. It used to be impossible to run the left side at low water, but the flood of 1997 scoured away the boulder field somewhat, and now the left side seems class III at most flows, but might not remain so. Even at low water this rapid closely follows the one above, and at high flows they merge. Several large midstream boulders (or holes) must be avoided, by moving either to the right or left, depending on flows, although other routes are possible. It is an advanced maneuver to “floss the tooth” at any flow. Motel Hole, almost always flips canoes and kayaks, but can be avoided on the right. Cranberry Gulch river access (limited parking), across the river from Cedar Lodge. At high flows this is an alternate put-in because the gradient is less steep downstream. Rapids downstream are often close to the road, right up against an embankment. South Fork Merced enters on the left. This contains an excellent advanced run, although the 4WD road down to put-in is very tough. Continuing, a class III+ rapid around a low island is just downstream. Near some houses, where the river bends left near the highway, Ned's Creek enters on the right. A big eddy below the mouth of the creek makes a good stopping point, so you can walk over bedrock to the bottom of the rapid. A sneak route is often available starting on the left and finishing in the center. The third and final drop is the steepest, but the other drops are more critical to run correctly in order to avoid swimming. It's quite easy to carry up the scouting route to run it again. Guide falls out but paddlers ace Ned's anyway! Former suspension footbridge, washed out in the flood of 1997, perhaps to be replaced someday. A small gravel bar on the left makes a fair take-out. Downstream, rapids taper off to class II, with many avoidable class III holes, as the gradient eases to 20 fpm. To reach take-out, drive east from Mariposa on highway 140 towards Yosemite. After the road crosses a pass and first descends to the river, you see a single stone structure that constituted the town of Briceburg. From this point, continue upriver for about 6 miles to a small turnout where the suspension bridge used to be, or has been built again. To reach put-in from there, continue upstream towards Yosemite park for about 9 more miles. Find parking where highway 140 crosses the Merced for the first time (not counting the south fork Merced). If you reach the restaurants and lodgings of El Portal, you have gone too far. To find nearby food and lodging, type Mariposa into the box and click Search.